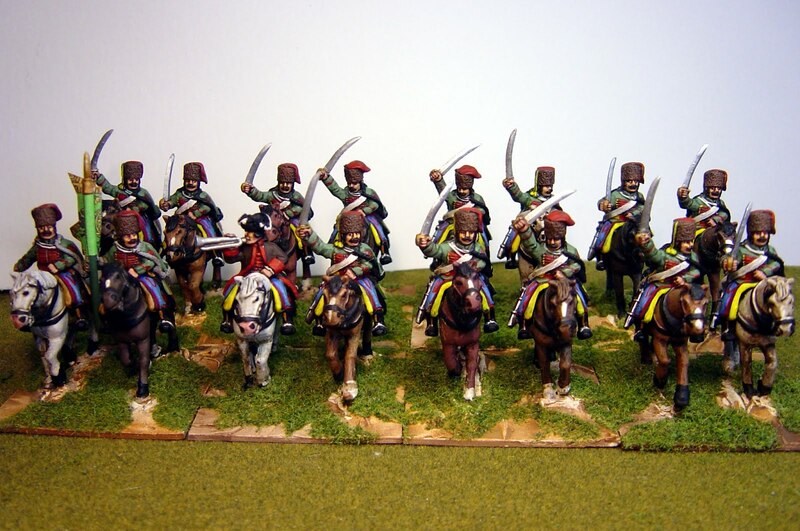 This Hungarian Hussar regiment in Austrian service was raised in 1696 and was a very busy unit being involved in campaigns against the Turks, in Italy, in Flanders (it was at Malplaquet), on the Rhine, in Bavaria during the WAS and even, briefly, was stationed on Corsica. During the SYW it participated in the battles of Lobositz, Prague, Kolin, and the raid on Berlin. Thereafter it appears to have been in service with the Reichsarmee. The colour scheme of apple green and blue is rather daring! Figures are Crusader 28mm. 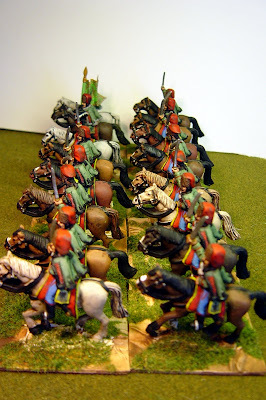 One of the prettiest color schemes for hussars I think I've eve seen. Lovely! They look great! Really good work! I just bought the same figures at Hamburger Tactica and also thought of painting the same regiment. Your post is a real good inspiration for doing so. Great work Nigel. They look fantastic!